Kinesiologist designed support and graceful, styling for executives, managers and conference guests. This Ergonomic Series offers seating for persons of most statures. Select the proper fit for you from our Big and Tall Series, our Standard Series or our Petite Series. 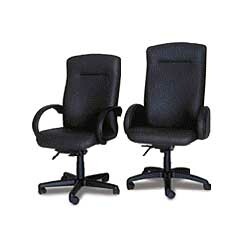 Your complete comfort and ergonomic support are provided during the often encountered "prolonged use" of your office chair. High resiliency foam is used throughout the chair with attention to detailed sculpting. Our distinct and ergonomically proportioned interior hardwood shells provide the proprietary foundation for all three series of ergonomic executive chairs. Spectracom Technologies Corporation, 14700 North Hayden Road, Scottsdale, AZ 85260. Tel: 480-443-1400; Fax: 480-443-1488.